Lost River Mountains sure are pretty except . . .
. . . . when you look down at your feet in the meadows. We went on a range inspection tour Oct. 2, 2007. We inspected the Pass Creek Grazing Allotment. The photo below shows a headwaters tributary of Wet Creek, an important Bull Trout stream. The little stream (Pine Creek) gradually gained water — burbling and splashing along as it carried a fine mixture of mud and manure down from Pass Creek pass toward the Little Lost River Valley below. The humps are long lasting features caused by cattle standing on a wet meadow. I decided to put this photo up too. On the Lost River Ranger District, the grazing permittees are supposed to meet at least minimum “stubble height standards” at the end of the grazing season — 4 inches. In the photo below the standards were easily met!! The way they measure them is to take the average height of the remaining “hydric” species along the waterline (that’s way down in the incised stream in the photo — Pass Creek). Does this make sense? 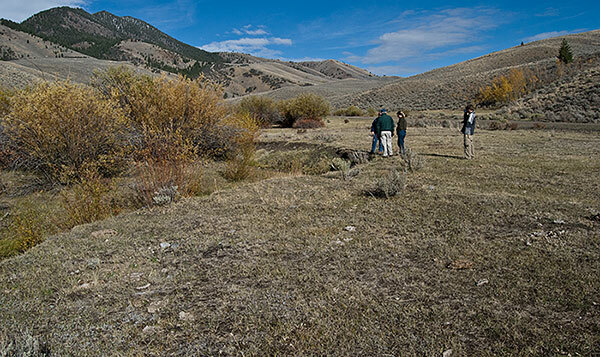 On October 2, 2007 ~ members of Western Watersheds Project went on a Forest Service tour of the Pass Creek Allotment. 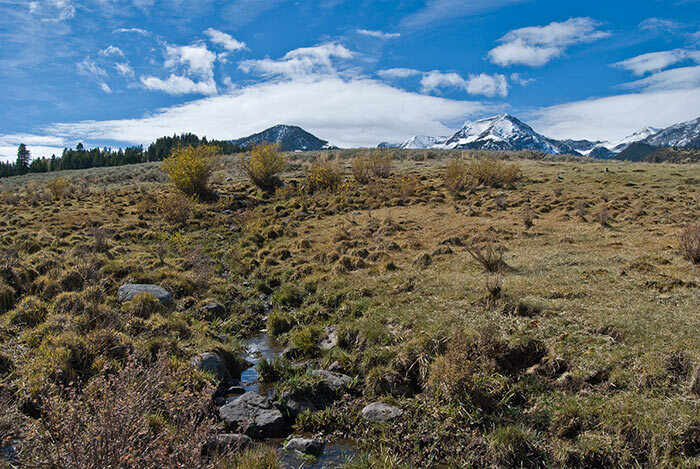 What they found in the Lost River Range, a place some consider to be among the most scenic places in the West, were watersheds devastated by livestock. Streams that fed into endangered Bull Trout habitat choked with sediment, cow feces, and blown out wildlife habitat. 6 Responses to Lost River Mountains sure are pretty except . . . Yet another “fine” example of overgrazing and mismanaged allotments. Not to worry though…I wrote to Reid of Nevada, asked him to attach a rider to the budget that makes it law that BLM or Forest Service can’t allow use of an allotment if their office is not adequately funded to properly manage and monitor said allotments. I wonder if livestock owners take care of their own personal acreage in this manner. Bet they don’t. Oh wait, this is their own property, or so it seems. I can not believe that Ralph put this up, Pass Creek is dry from the top to the bottom and Ralph knows this. I was a joke when they named it Wet Creek. Most ranchers and cattle really have nothing to gain by grazing. As for bull trout get on Google and find Pass Creek , you will see that what little water that comes our a low canyon on the west of Pass Creek dumps into the earth quake fault at the lower end of the south side of Pass Creek. Why in the world did you lie to the people Ralph. You must be talking about a different Pass Creek (there are a number in Idaho) and several of them are dry, but there is only one Wet Creek, and it is fair-sized stream for the Little Lost Country. I think you must be referring to some place up by Doublesprings Pass. I am talking about the Pass Creek that runs west from Pass Creek summit in the Lost River Mountains and eventually through Pass Creek Gorge, and the Wet Creek that runs eastward down the other side running into the Little Lost River. These areas are part of Forest Service and (with Wet Creek) grazing allotments for thousands of cattle. Because I have been visiting these streams, including fishing Wet Creek since the 1970s, I can hardly be mistaken. This has been updated with a link to a YouTube video of the mess now at the bottom of this post.